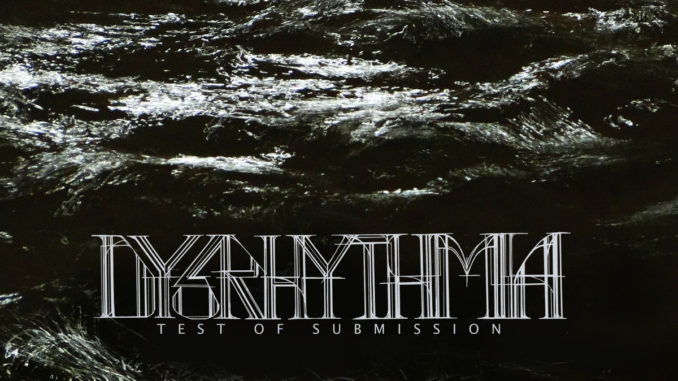 Test of Submission is the sixth album by the New York trio DYSRHYTHMIA. The trio, consisting of members also found in Krallice, Gorguts, and a few hundred other bands (see interview with bassist extraordinaire Colin Marston here), keep exploring the many fields of instrumental, modern progressive music. The genre tag often ascribed to them is “technical/progressive rock/metal”, and as so often, this tells you very little besides the formal aspects of the music – yes, it’s technically advanced and equilibristic, and what imbeciles might call “difficult for the sake of being difficult”, musical masturbation and whatever. But some people never understand, do they? This is none of the sort, and never trust tags and labels to explain a sound that goes beyond words. The music is more like a complex choreography in which the three dancers simultaneously create their separate flows and narratives, while still adhering to the same main arch. Each instrument is equal in contributing to the complex web of melodies, harmonies, timbres and (dys)rhythms, intertwined and counterpointal at the same time. It’s always (somewhat) harmonious, more so than before, all sections glue together in their own logics in a way I’ve rarely experienced before. It’s an entire new world spun from three sets of strings and batteries. It’s evocative, alluring, confounding, stunning – but never infuriating, confusing or annoying; it all makes sense. Unhindered by the restraints of conventional song writing methodology, the individual narratives of the songs run their own courses, impulsive and playful, and not seldom hauntingly, breathtakingly beautiful. It’s a roller-coaster in a labyrinth on ayahuasca. And the sound is perfect; organic, damp and clear and raw, atmospheric and immersive. The images I receive from this album are those of a long since faded civilization, whose ruins are still standing, withering and overrun by tangling webs of moss and weed and dirt. Underneath the veins and arteries of highly sophisticated technology still run, comatose and forgotten by the surrounding universe. Labyrinths built by creatures of completely different minds than ours, fully functional and logical in their own terms but incomprehensible to most humans. High magick of a superior alien race. Really, like nothing else. Amazing album.